Have you ever come across a technique that you have been intrigued by and been surprised that it is something you can easily do at home? 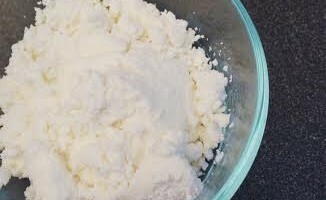 I had heard many times how easy it is to make your own ricotta cheese and knew I had to give it a try. They were not kidding when they used to term simple. The hardest part was finding a store that carried the cheese cloth used to drain the liquid off. It take less then 10 minutes cook time and 10 minutes drain time and you have a cup and a half of the freshest ricotta cheese available! The ingredients are minimal and you only need a few tools for the job. Cheese cloth is needed to drain the cheese and a cooking thermometer is very helpful though you can still make it without the thermometer. You can usually find the glass candy thermometers in the gadget section of your grocery store for around $5.00. And don’t be surprised if you eat at least half of your first batch over the sink while taste testing it. In a large pot bring the milk, cream and lemon juice to a simmer over medium high heat. Allow to come to a temperature of 185 degrees. This will take less then 10 minutes. Stir occasionally. 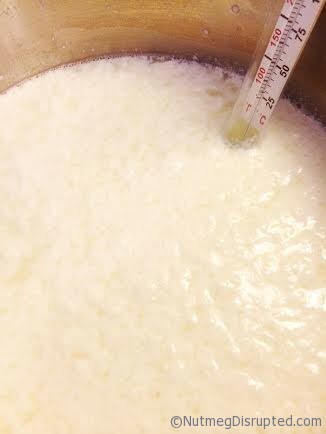 If you do not have a thermometer just watch the milks and when the curds separate from the whey it is ready to come off the burner. 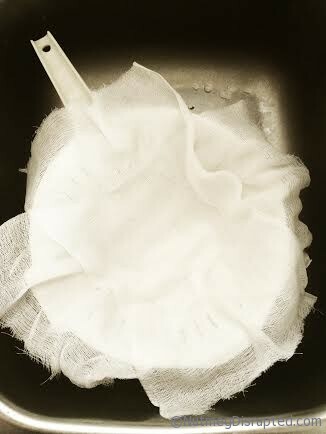 Line a fine meshed colander with two layers of cheesecloth. 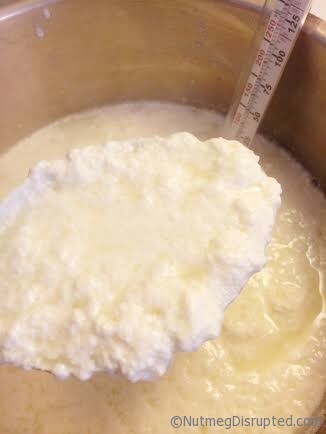 Slowly pour the curd into the colander to drain. Once the liquid has drained off bundle up the cheese cloth and give it a bit of a squeeze. Remove the cheese to a bowl and lightly salt. Depending on what you plan on using your ricotta for you could add some extra flavor but adding herbs or garlic. But it is just fantastic the way it is and I have found myself adding it to all sorts of dishes and even enjoying it just by itself, which I have never ever done with store bought ricotta. Try it once and you’ll be hooked. Seriously good stuff! Thanks for the reminder that ricotta is worth making. I look forward to trying your recipe! We’ve been wanting to make ricotta for a while now, and you’ve given us a new motivation with this easy to follow recipe! Thanks! I’ve never made ricotta at home only creme fraiche..this is very similar though..the only difference really seems to be the addition of heating the mixture! This will make an appearance in my lasagna soon! I love how simple this is and your great step by step instructions. The advantage of making your own cheese is that you can choose to use organic, non-homogenized milk.